This elegant hotel in Munich lies beside the English Garden, a 14-minute tram ride from Marienplatz. 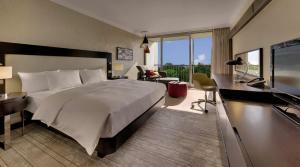 It was newly renovated in 2012, and offers stylish rooms and a modern spa centre with indoor pool. The air-conditioned rooms of the Hilton Munich Park feature a balcony with panoramic views, cable TV and minibar. Room service is available 24 hours a day, and free WiFi is available in public areas. A rich continental or buffet breakfast is offered each morning and the Tivoli Restaurant and Club serves international cuisine. Drinks and snacks are offered in the People’s Lounge café, featuring a live piano. After a workout in the Munich Park’s gym, guests can enjoy a sauna session or relax with a massage. Bicycles can be hired for exploring Munich’s old city. Tivolistraße Tram Station is 600 metres from the Hilton, offering good public transport connections.